ST. PETERSBURG, Fla. — A victim describes the terrifying encounter after she says she was pulled over by a man impersonating a police officer. The St. Petersburg Police Department is investigating and released a composite sketch of the man officers hope to identify. "It looked like he had a gun holster maybe other pockets with handcuffs like a normal police officer," said the victim, who asked to not be identified. She described the man as muscular and over 6 feet tall. She says she was pulled over on Thursday around 10:30 p.m. near 34th Street South and 1st Avenue in St. Petersburg. "When he went to search me, he got aggressive and touched me inappropriately," said the victim. 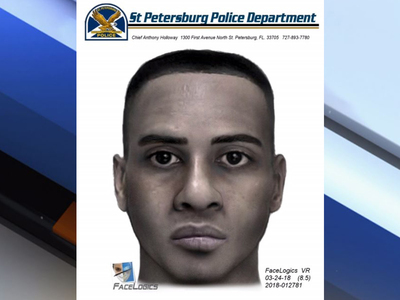 According to St. Pete Police, on Thursday night a tall African-American male in a white police-style sedan made a traffic stop, asked for the driver's license and later drove off. "As soon as he walked up to the car he announced himself and then he asked for my license and registration," said the victim. "We strongly advise anyone who feels unsure about the identity of a police officer, to call 911, give them your location and the operator can verify whether or not it is a legitimate traffic stop," SPPD said in a press release. St. Pete Police released video on Tuesday of a white vehicle seen circling the area where the illegal traffic stop happened. Officers say it might have been involved in the incident. If you have had a similar experience or have any information about this incident, please contact the SPPD at 727-893-7780.